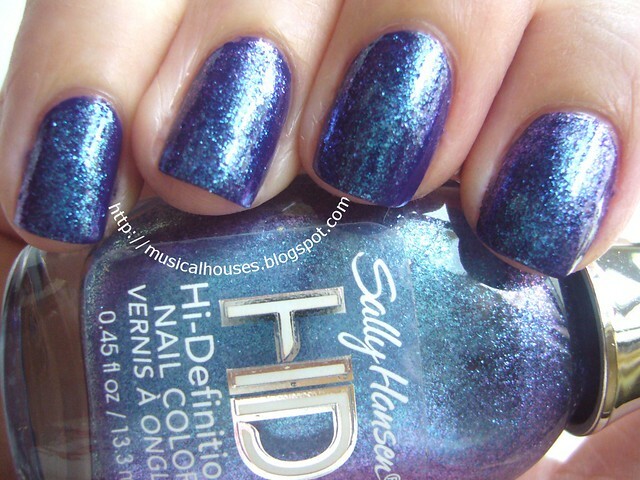 So you know the Sally Hansen HD Polishes I got awhile back? I finally gave those a whirl - seriously, it's horrible how much stuff I have, so much that I buy things when they are shiny and new and don't use them til a year later...But anyway, I'm finally showing you guys a mani I did with them, and it is awesomesauce, if I do say so myself! For this mani, I used Nails Inc Belgrave Street as the base, and then layered Sally Hansen DVD. I won't go into how much trouble I had to go to in order to get the US-only Sally Hansens. Seriously, Sally, please release more interesting colours here too? I promise you'll have customers...Don't hate us because we happen to be living on the wrong side of the Atlantic. But anyway. I absolutely love this combi. 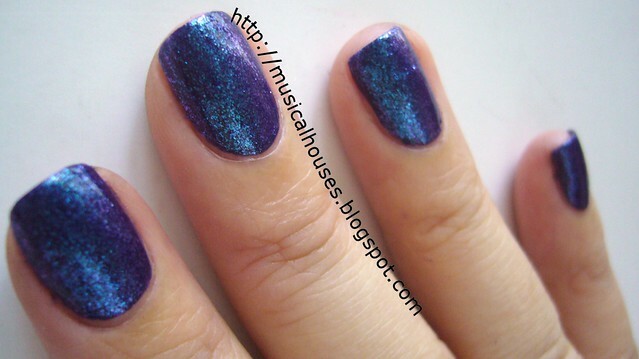 Belgrave Street is a blurple creme, which makes it the perfect base for DVD, which is blue reflects in a clear base. The net result is that my nails have this super cool blue-flashy glitter reflects thingy going on, and it even flashes pink at some angles. Super cool. Anyway, shame on me for waiting so long to use these. I'm absolutely loving it though - it's like a super cool way to add some duochrome to a simple mani. what a gorjus colour of polish!